Krispy Kreme French Toast. The thought occurred to me one morning while I was trying to decide what to prepare for breakfast. There was no bread in the house, nor leftover rice for fried rice. All I found was a box of leftover Krispy Kremes. Idea! 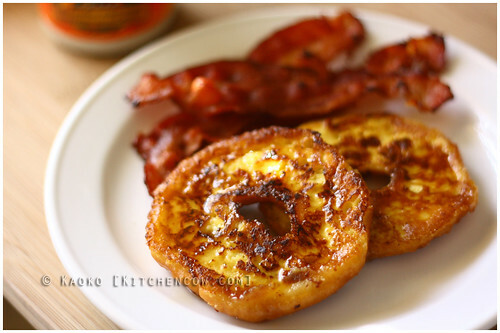 Why not turn them into french toast? I mean, if you can use them as hamburger buns for Krispy Kreme Cheeseburgers, I don’t see why it can’t be used for other recipes as well. Breakfast that will leave you speechless. Was I absolutely nuts for thinking of it? A quick google pointed out that other people have thought of it before — not that seeing it had no precedent would have stopped me. But it was nice to think that some like-minded souls have trudged the Krispy Kreme path, too. 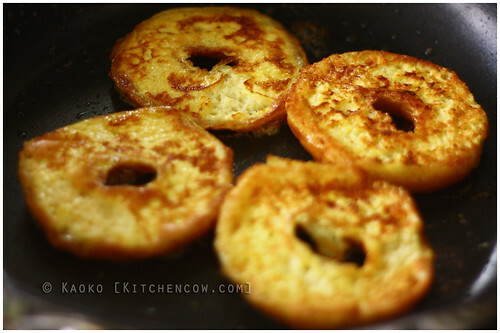 Plus, this isn’t the first time I’ve played around with French Toast. Defilement? But it’s oh so right?! Was it good? ABSOLUTELY. Think buttery crisp tops, enveloping a soft, fluffy center finished off with a sweet, caramelized sugar bottom. Eating it by itself will make you forget about all other french toasts you’ve had before. Eating it with a drizzle of real maple syrup will transport you immediately to heaven. Eating it with a drizzle of real maple syrup and a side of perfectly crisp bacon will open a rift in the time-space continuum and cause the end of the world as we know it. At least until you get your bearings and come back to your senses. Then you take another bite. With a deft, light hand, slice your Krispy Kremes in half. Stale Krispy Kremes, a day or two old is best because they handle better. Beat together your eggs, milk and vanilla until well blended. Melt butter in a pan. Be generous with the butter. Butter is your friend. No, not margarine. Use butter. Don’t be afraid of the fat. Who are we kidding, we’re cooking with Krispy Kremes! Dip your Krispy Kremes, sliced side first into your egg and milk mix. Don’t let it soak for long, a few seconds would suffice, just enough to pick up that glorious milk and egg. Letting it soak will create soggy toasts instead of that wonderful fluffy thing. Dip the other side as well. 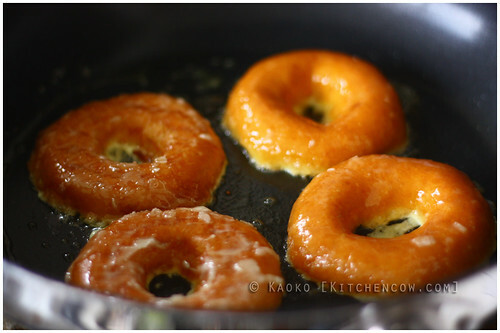 Slide your Krispy Kremes directly into your hot buttered griddle or non-stick pan. Put the sliced side face-first into the butter. Don’t let it linger elsewhere, as soon as you’re done dipping, transfer directly into the pan. Watch is sizzle, smell it burn. Heaven. Once browned, flip it over and let the sugared side turn into a caramelized mess. Heaven to earth then heaven again. Transfer to your plate, sliced side up to hide the caramelized bottoms. That way, it’ll be a wonderful surprise. Drizzle with maple syrup if you have some. Then serve with bacon. Try to repair the rift you created, then make some more. Great post! i’m a butter person myself… Sounds crazy but this sounds really good enough to try. Divine!!! I am 100% in your corner — I love making different versions of French toast! Croissants are also good 😉 Then stuff them with Nutella! I am trying this the next time I have Krispy Kremes!